The Pacific War Online Encyclopedia: Harmon, M.F. Table of Contents Next: Harrill, William K.
"Miff" Harmon qualified as a pilot before the First World War and saw action with the Punitive Expedition to Mexico and in France. He was Halsey's senior Army commander during the South Pacific campaign, where his excellent judgement and ability to get along with the Navy made him an effective troubleshooter. 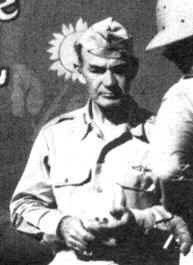 He activated XIV Corps at Guadalcanal in January 1943 and took over land operations at New Georgia in July 1943 when that campaign bogged down. In February 1945 his flight went down somewhere between Kwajalein and Johnston Island, and he was declared missing and presumed dead on 26 February 1945. Taaffe (2011) describes Harmon as "a peppery and opinionated man" who nonetheless got on well with Halsey and gained the respect of almost everyone in the theater. Graduates from Military Academy, standing 74th in a class of 95.